The LavaBurst! That one's got non-standard parts on it, though, and always has. I believe Hans said it looked like an employee build or something along those lines. This new one looks legit! I *love* the flame pattern on the new one! Is it 3D-looking from an angle? I think I have another one that's the same finish. I'm so deep into writing technology these days that I can't even remember what I have anymore. How sad is that? Well, when I get the new book done I'll be able to get back to reviews! 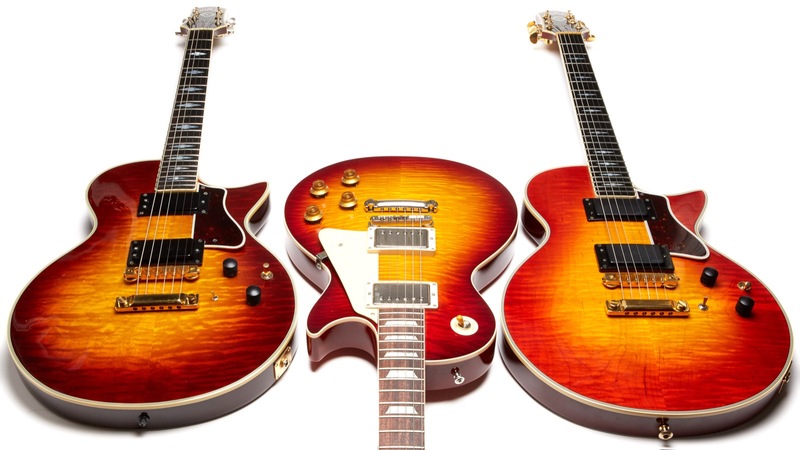 Nightbird GG on the left, 2018 Les Paul R9 in the middle, and I can't remember what on the right. Either a II or a Custom. I think I need a break. Hey Steve - did you get it from CME? That looks kind of like their kind of pic. Did I mention that's a damn fine good-looking guitar? Wow nevets, looks like a sunset!